What is a spring check-in? For me this yearly ritual means stepping back from the world of minutia and detail where I can get stuck. It means reviewing my caseload and schedule with a fresh eye. It means touching base with teachers or grade-level teams to hear their needs and concerns as they enter into the last trimester of the year, and circling back to students that came up as questions during fall screenings. And it means looking at my current students’ goals and data to make sure that expected progress is being made. Now, I know what you’re thinking… Why do I need a spring check-in to do this? Don’t we do this stuff all year long? The short answer is yes, these tasks are on our plate all year long. But personally, I know that I can’t do everything every day. I tend to be better about these big picture tasks in the fall, when I’m setting up the schedule and talking to teachers about new students in their classrooms. But over time, I naturally focus in on the squeaky wheels. My attention and time, rightfully so, is drawn by my students with disruptive behavior, the meetings that are approaching, the parents who call, and the teachers who knock at my door. The Spring Check-In allows me to reset the balance. 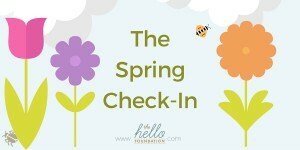 The Spring Check-In coincides with other natural check-in activities. I often allow progress notes or spring parent-teacher conferences be my tickler to start the process. The timing is important because there are plenty of days to make change before the end of the year. A check-in like this always uncovers issues that need attention and some kind of action. When they are uncovered too close to the end of the school year, it is tempting to “handle it in the fall.” Uncovered now, there is still plenty of time! students? Students certainly benefit from the consistency of “auto-pilot” mode, but the Spring Check-In might result in changes to my schedule – switching up groups to be a better fit, increasing or reducing time to better meet needs, changing our therapy target, or initiating dismissal! teachers and staff? Some teachers may hunt me down to get their questions answered, but most teachers are happy that I find them! I may have short list of students to ask them about (currently on my caseload, students I had screened in the fall, or past concerns) and my visit is a trigger for them to mention their new concerns. Good referrals, even for articulation, can be months in the making. With trial interventions, meetings, and data collection – now is the time to start the process! administrators? Around this time of year, administrators have to start thinking about next year. This kind of check-in review will ensure that you have the most accurate and up-to-date information to give them. If you have thoughts about how your job or time might be structured differently next year, this is the time to bring it up! the SLP and/or SLPA? I used to worry that a process like this would only create more work for me (just keep your head down, right?). What I have found is that talking to teachers and asking the tough questions and acknowledging needed changes – these are all part of making my work visible. All of these needs existed before, but pre-check-in, I only had to worry that they would come up at a surprising or inopportune time for me. After my spring check-in, I feel more aware and in control of my own workload. It is up to me to prioritize, schedule out, and get it done!